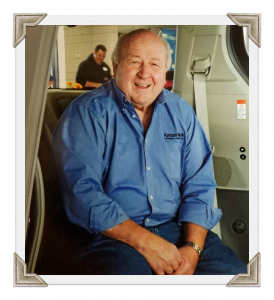 Recently, Kansas Truck Equipment lost a beloved family member. Richard “Zack” Zackula passed away on September 15, 2018. Along with his wife, children, grandchildren, and great-grandchildren, our staff mourns his loss and cherishes his memory. He was a visionary within the company and a champion for people with disabilities. Zack was just 21-years-old when he started working for Kansas Truck Equipment. This was years before our second building and mobility division were even a speck on the horizon. As a mechanic, Zack worked in the shop installing farm bodies on trucks for rural customers. He also worked in our fledgling bus division, delivering Blue Bird buses across the state of Kansas. Service Manager Karl Gragg would rent a small plane and fly Zackula and other staff members to a Blue Bird plant that was in Mt. Pleasant, Iowa. Today, our mobility division is housed in a second building and features a showroom where customers can view products in a climate-controlled environment. Zack’s ability to fabricate real life solutions for mobility issues was the impetus for our mobility line. When he retired after 48 years, the mobility department had become his legacy. Over the years, Zack touched the lives of thousands and considered many to be his friends. He enjoyed our annual Mobility Rodeo because it gave him a chance to chat with customers new and old. To our friends and customers who have reached out over the last few weeks – Thank You. We love hearing your stories and we know you’re hurting too. Thank you for helping us celebrate the life of Richard “Zack” Zackula, a person who showed us the importance of helping our fellow man and paying it forward whenever we can.